Very proud of my friends and colleagues Ruth Kovac, Harold Staviss and David Birnbaum on this important step forward. My readers will recall my many posts and communications with various ministries and agencies of the Quebec government, as well as the city of Montreal (notably the Fire Department) demanding that messages pertaining to public safety be in both French and English, as permitted by the oppressive and dreaded Charter of the French language. Many of these communiques received a polite we’ll look into it with little action or follow up. The case of the highway road signs proclaiming completely unintelligible warning messages to any non-French-speaker were particularly unjust and illogical. Search my blog for these posts and pictures. Well, thanks to perseverance and determination of Ruth and Harold they pushed and hounded, and engaged the assistance of our duty-bound MNA, David. The result is favourable in terms of agreeing to pictograms, unfortunately not bilingual signs, but the work is still to be done by the ministry. We’ll continue to follow this important dossier and hold the next government to account and press forward until this gets done in the name of public safety! Transports Quebec is in the process of changing French-only directive highway signs to pictograms, and will gradually also do so on electronic message boards, provincial Transport Minister André Fortin told The Suburban Saturday. The changeover is coming about following a 7,000-name National Assembly petition, created by Hampstead lawyer Harold Staviss and Cote St. Luc councillor Ruth Kovac and sponsored by D’Arcy McGee MNA David Birnbaum, which sought bilingual traffic signage dealing with health and public safety. Last year, we reported that Transports Quebec committed to more and better pictograms. Fortin praised the petition, and pointed out that he recently met with Staviss and Kovac along with Birnbaum. Some examples already addressed include signs indicating thaw following the winter season, and uneven pavement. Another aspect of the petition was electronic message boards warning of accidents and incidents, and providing directives. The Minister also pointed out that, as the petition addressed, sometimes there are too many words on the message boards, “and we agree with that. “We certainly don’t want our message boards to be an added distraction to drivers, so we’ve already given a directive to the various regional sections of the ministry to leave the boards blank if there’s no particular information of value. Staviss and Kovac were very happy. “We are ecstatic with the news that the traffic signage and message boards on Quebec roads dealing with health and public safety are in the midst of being replaced by symbols or pictographs,” they said in an e-mail to The Suburban. “It is welcoming to know that such public safety signage as Dégel shall be replaced by pictographs, which most certainly will be more clearly understood by motorists using our Quebec roads. Birnbaum praised Staviss and Kovac, and those who signed the petition, “which I was pleased to present in the National Assembly. And, frankly, I commend The Suburban for having kept this issue in the news. These French-only warning signs are actually dangerous for highway motorists not proficient in the French language. When approaching these massive electronic billboards and not immediately recognizing ominous words like “cahouteuse” or “aquaplanage” Without mastery of French you wouldn’t know whether to pull off the road or to call 911 for an urgent translation! I’ve made numerous demands for bilingual warnings and their inaction speaks volumes, in any language. They don’t care if you don’t understand. A year after National Assembly petition, provincial government still has not responded to safety concerns. One year ago, on March 14, 2017, a petition we spearheaded was tabled in the National Assembly by David Birnbaum, the MNA for D’Arcy-McGee. The petition, which was just short of 7,000 signatories, requested the Ministère des Transports du Quebec (MTQ) and the Ministère de la Culture et des Communicatons to take the necessary steps so that all traffic signs and electronic alerts or messages dealing with public safety or health be in both French and English, when no symbol or pictogram exists. Traffic signage, as well as electronic alerts or messages, such as “Respectez les feux de voies,” “Risque d’acquaplanage,” “Allumez vos phares” and “Ralentir” deal solely with public safety — everyone’s safety regardless of language — so why have the ministries abstained, and why are they continuing to abstain, from applying the second paragraph of Section 22 of the Charter? Since the petition was deposited in the National Assembly, there has not been a single change dealing with public safety on any highway signage in and around the Island of Montreal — not one — and we highly doubt that any changes have taken place anywhere in the province. Where there is no pictogram, every single highway sign dealing with safety is still only in French. There has been no increase whatsoever in any pictograms dealing with the safety issue. In fact, about six weeks ago, while driving from Dorval to Montreal, there was an electronic sign advising motorists that there was fog in the area. I think we would all agree that a fog advisory is a safety issue and not merely information. So where was the English? We are frustrated and taken aback that absolutely nothing has been done to improve the highway signage and messages as regards public safety since last March. In fact, nothing has been done since we initially communicated with the MTQ well over three years ago. The responses and excuses given then are the same responses and excuses given today. In a nutshell, our concerns were not even addressed; they were just simply ignored and swept under the rug, apparently in the hope that we will just go away. It is interesting to note that on many highways in Ontario (and most probably other provinces as well), signage, whether for safety or information purposes, is in both English and French. It is very sad indeed that in Quebec, language still trumps safety. What a shame! A majority Liberal government is in power, with a newly appointed minister responsible for relations with English-speaking Quebecers, but it continues to treat the English language as non-existent or as a disease. Our concerns have nothing to do with language, they have all to do with everyone’s safety. Harold Staviss is a Montreal attorney and Ruth Kovac is a Côte-St-Luc city councillor. A French-only highway safety sign. The Quebec Ministers of Transport and Culture and Communications have committed in writing to placing more and better safety-related pictograms on highways, Côte St. Luc councillor Ruth Kovac told The Suburban Monday. The commitment by ministers Laurent Lessard and Luc Fortin respectively was the province’s response to a nearly 7,000-name National Assembly petition, created by Hampstead lawyer Harold Staviss and Kovac and sponsored by D’Arcy McGee MNA David Birnbaum, calling on Quebec to install bilingual traffic safety signs, as allowed by the province’s language law. The news of the commitment came during a meeting Kovac had Friday with Birnbaum. “It took 40 years to get the ministries to acknowledge that our road signs could be better,” Kovac said. “They said, ‘let’s do the best pictograms we can,’ which I have no issue with. First and foremost, it’s always about road safety. She added that pictograms could be attempted on electronic billboards that warn of safety issues happening at certain times. Kovac said Quebec’s commitment fell short of allowing English on traffic safety signs if no suitable pictogram exists. Kovac thinks Quebec did not go the extra step of committing to add English if no pictograms exist, to avoid reopening the language debate, even though the law allows English on those signs. The councillor added that she and Staviss will be taking photographs of signs they have complained about over time, and will point out whether or not they have been changed. “Now we’ll be sign inspectors for free!” she joked. “I also have visitors coming from the U.S. in a couple of weeks, and I will ask them to take pictures or note any signs that they really don’t understand. Birnbaum commended Staviss and Kovac for their efforts, the community for its response on the petition as well as The Suburban for focusing on the issue. Birnbaum also confirmed that the directive also says that when a pictogram doesn’t exist at the moment, regional authorities are asked to communicate with the operations department of the Transport ministry “to try and develop one. “It’s a start,” the MNA said. 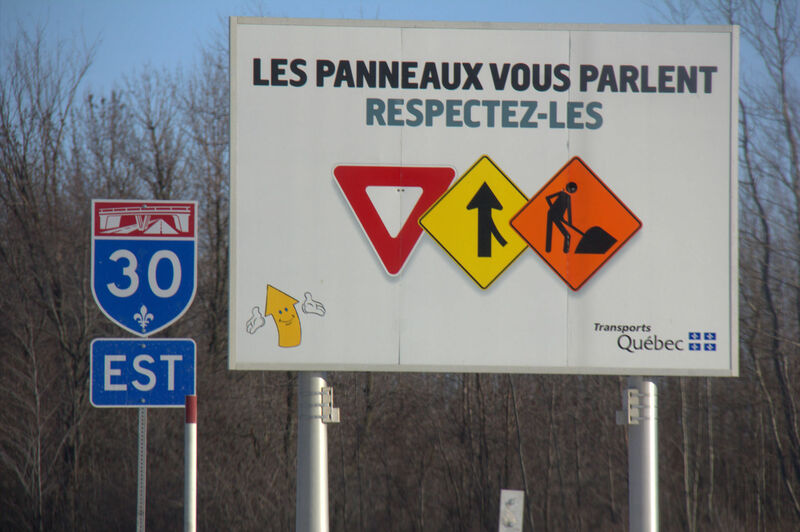 As we all know, all traffic signs on Quebec highways are solely in French. When driving, do you know what «Respectez les feux de voies», «Risque d’aquaplanage», «Dégel», «Ralentir», «Allumez vos phares», «Voie cahoteuse» and «Incident voie droite bloquée» mean? Are you aware that according to the Charter of the French Language, the French inscription on traffic signs may be complemented or replaced by symbols or pictographs, and another language may be used where no symbol or pictograph exists? Seeing that the aforementioned phrases have to deal with one’s safety, why are they not in English as well, as the charter clearly provides? It absolutely makes no sense whatsoever that the protection of the French language is more important than one’s safety. Shouldn’t the safety of everyone, whether French speaking or English speaking, be of prime importance? That is precisely why Ruth Kovac and I presented a petition to the provincial legislature through our legislator David Birnbaum. Time is running out. The deadline of March 2 to sign the petition is fast approaching. If you have already signed the petition, we thank you. If you have not signed, please do so. However, in all instances, please make sure that you share this with your family, friends, acquaintances, neighbours and your neighbours’ friends. Share on Facebook, Twitter and Instagram. The petition can be found at: www.assnat.qc.ca/en/exprimez-votre-opinion/petition/Petition-6407/index.html. Numbers do speak volumes and volumes can bring about change. The petition has nothing to do with language; it has everything to do with safety. While Transport Quebec is investing $11 million in upgrading technology to ensure safety on the highways, one million English-speaking Quebecers and many more visitors should be very concerned that absolutely no attention is being given to inform highway users of safety concerns in their own language. The fact that the Quebec Transport Department has installed massive electronic safety panels in the first place speaks to the need to inform motorists of serious issues ahead. The very nature of these messages is to alert, to warn, to safeguard motorists and passengers. That Quebec would expressly restrict such messages to French only speaks volumes of its intolerance of the English language and its disregard of English-speaking people, be they Quebecers or from elsewhere. This is totally unacceptable especially since Bill 101 allows for the use of English when it comes to public safety. Traffic isn’t the only thing Quebec is controlling in this high-tech centre. Language is being tightly controlled as well and this sends a dangerous message. Any citizen of a free and democratic country should be outraged that its government would play with the safety of its population and its visitors for political purposes like this. The fact that the Quebec Ministry of Transport has installed these electronic safety panels in the first place speaks to the need to inform motorists of serious issues ahead, on the road. The very nature of these messages is to alert, to warn, to safeguard motorists and passengers. That Quebec would expressly restrict such messages to a single language speaks volumes of its intolerance of the English language and its contempt and disregard of English-speaking people, be they Quebecers or from elsewhere. This is totally unacceptable. Join me in calling upon our government, through your MNA, to change this dangerous and discriminatory policy. I call upon my MNA, David Birnbaum, a principled man of goodwill, to speak with his colleagues in government, and to help them to see the serious error in this dangerous policy. 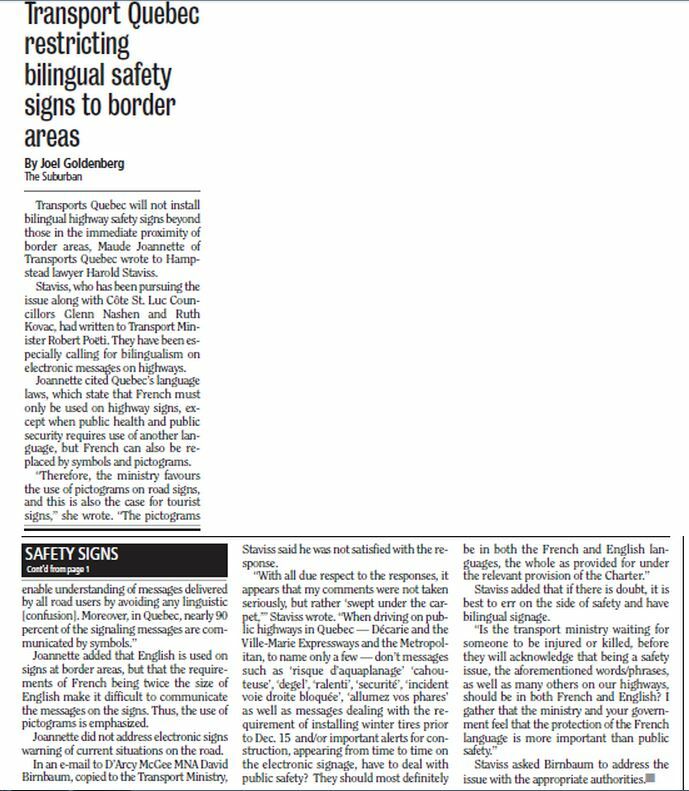 Harold Staviss is keeping up the fight to have bilingual highway safety signage in Quebec, rejecting the transport department’s argument that the signs have nothing to do with health or public security and thus do not require English under the law. In my opinion: Thank you Harold for continuing to press the transport department on their misguided application of the overly restrictive language laws. The large panels placed strategically by Transport Quebec are there for one reason only: To provide safety alerts to motorists. For them to argue that these messages do not constitute public safety information is completely dishonest and downright dangerous. 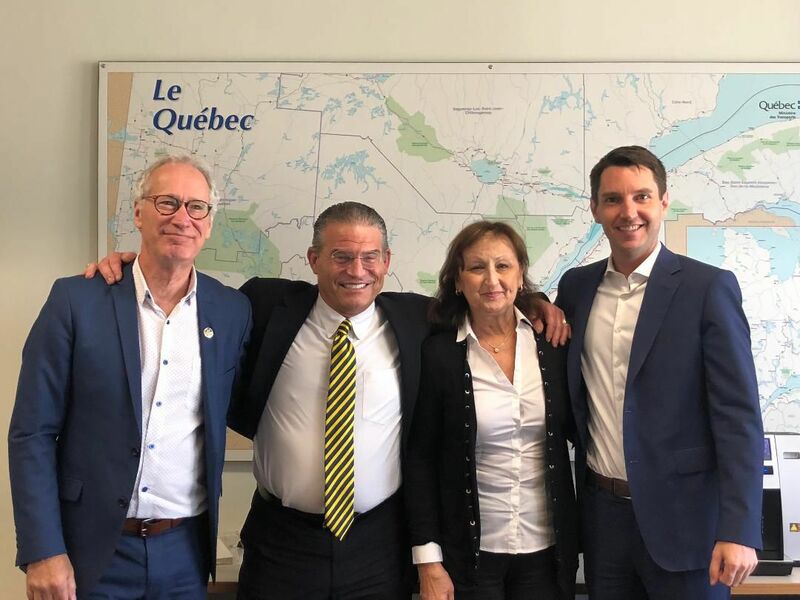 D’Arcy McGee MNA David Birnbaum must also take up the cause and push for bilingual communications in public safety from various Quebec departments as permitted under the law.